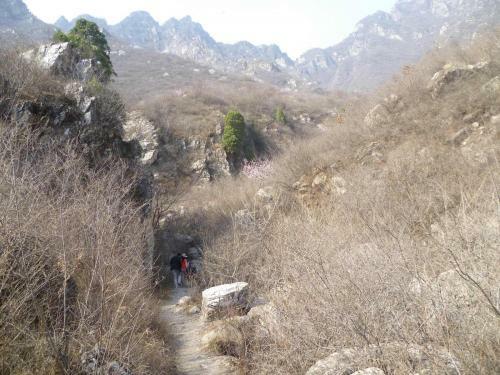 To the west of Beijing is a huge mountainous area, with small valleys snaking up among steep, rocky, and spectacular mountains. The highest peak in the area (about 6,500') is Lingshan. We take a bus and taxi to a small village near its base. The valley is full of stone walls - there's one every hundred feet or so, sometimes for terracing but more often not. It's as if the people who lived here became obsessive-compulsive about building them. There are some fruit trees - probably peaches - but these seem to have been abandoned. The area is trying to reinvent itself as a tourist destination. The little village has a go-kart track (not operational). We stay at a no-star hotel with unheated rooms (it's very cold). We've hired a guide to take us up the mountain. He turns out to be a 65-ish man, who smokes but has a certain vitality. He says he's one of only 3 people left in the village who are able to climb Lingshan. The next morning we start out, up a steep-walled canyon with a frozen stream running down the middle. It gradually opens up. Trees and of course stone walls appear. Our guide locates the spring that feeds the stream, and we both drink from it - delicious. The valley steepens and comes out onto a plateau with a stone hut at one edge. We stop for lunch. The guide has brought along his dog, a small short-legged, thick-furred guy who reminds of John Muir's Stickeen; I bond with him. We labor up some steep, broad dirt slopes, pass some false-summit rock outcrops, and finally come to a stone sidewalk that leads to the summit. The climb takes about 4 hours total, and gains over 4,000'. It's freezing and the wind has picked up to gale force, knocking me off the path a couple of times. Our guide, wearing neither hat nor gloves, doesn't seem to notice. The back side of the mountain (exposed, broad, ugly) is a 1-chair ski area. We had hoped to take the lift down, but it's not running. No snow. A stone staircase runs near the lift. I try walking on it but keep tripping on the small steps. Very tedious. We eventually reach the ski lodge. We've arranged for a car, which drives us back to the bus station. We go to a municipal swimming pool, which is huge (50m and about 12 lanes) and swarming with people. I'm not a good swimmer, but I manage to do a few laps and the whole experience is kinda fun. It goes fairly well. Slides are here. A group of us (Francois, Wenjing, Gabriel, several chinese students) take a Tsinhua minibus to a place called Jiankou, which is a trailhead with a lot of snack bars and tourist kiosks (but for Chinese tourists, not foreigners). There's a nice trail that goes up a steep rocky gully (maybe 1,500' vertical) and leads to an especially dramatic part of the Great Wall. The hike is nice, and a good workout, but I'm appalled by the volume of empty plastic water bottles and other trash along the trail. In places they've collected in piles, like a landfill. Who would do this? The negative aspects of my image of Chinese people (selfish, thoughtless) are reinforced by this. Of course, Americans used to do exactly the same thing with their soda-can tabs and Polaroid film backing. Note tiny figures atop Wall. It looks like a miniature Francois is hanging from my shoulder. Maybe the Great Wall arose from the same obsessive need to pave the wilderness that led to all those stone walls near Lingshan. Beijing's only climbing wall is outdoors, in a large park near the embassy district. We go there, and it's a lot of fun. For about Y60 ($10) you can rent shoes and harness and climb all you want; employees belay you if needed. The wall is 45' by 45' and has some overhanging sections. It's a groovy scene. I meet a couple of American guys and climb with them. There are a few good climbers, but mostly kids in sneakers. The park is beautiful in general, and there's a restaurant within the park where we meet Francois for dinner outdoors. Then we walk around, and pass the "Stone Boat", an old cafe/bar, and another restaurant. Just outside the park is "Maggie's", a fancy bar where fat pasty foreign men go to meet small Chinese women in slinky dresses, whom I assume are prostitutes. There's no one there, so we back go to the Stone Boat and I have a Mojito. When we return to Maggie's it has filled up a bit, and I watch the proceedings with amusement and a bit of disgust. We go with Francois to "Lush", a bar near Tsinghua that serves the largest cocktails I have ever seen. They come in two sizes: small is about a pint, and large is like the Gigantic Gulp from 7-11. I have a beer and hamburger (tastes like meat loaf). Francois also takes us to "Cafe Poste", a French restaurant owned by a friend of his, Christoffe. They serve only steak. Gang takes a group of us to his favorite Tibetan restaurant (he's been to Tibet a few times). The ambience is very nice, warm, and Tibetan. The food is OK. Francois tries the Yak Butter Tea, which is salty and undrinkable. After dinner there's an 'Ethnic floor show'. The last time this sort of thing happened (a couple of years ago) I was dragged from my chair and forced to participate, awkwardly and embarrassingly, in some kind of dance. Francois, with an evil expression, suggests that this is likely to happen again. I am so scared that I retreat to a sofa out of view of the stage. By default, beds in Chinese hotels are rock-hard and I can't really sleep on them. The only place I've found with soft beds is the Holiday Inn near IHEP, so I stay there. Unfortunately there's an ongoing problem with the room being too hot - about 80 degrees. There's no window. I complain to them every morning, and the response is always "we'll send someone up to look at it". Finally, on the last day they switch me to a room where there is a window that opens about 3". This is a big improvement. However, I shan't be staying there again. There's a big park where, on weekends, amateur music groups congregate. Many styles are represented: some are doing Karaoke and dancing; some are zealously singing Mao-praising revolutionary songs; some are doing Peking Opera excerpts. As you walk on the park's broad paths, under its large shady trees, you hear a changing mixture of 4 or 5 of these groups, kind of like a practice-room hallway. By the way: this park features the tree where some Chinese emperor hanged himself when he realized that the rebel armies were storming the city and that all his troops and advisors had deserted him. Before doing this, he forced his wife and concubines to commit suicide too. I may have the name wrong. This is a modest-size museum in a temple-style building. It had exhibits of a) modernistic stainless-steel sculptures that evoked classic Chinese things like warriors; b) impressionistic oil paintings by a modern artist; c) paintings by a contemporary artist from the northwest province of China that borders on Kazhakstan, where the people are Muslim, look middle-eastern, and (according to the paintings) dance and party all the time. A couple of them had somewhat contrived images of Chairman Mao and other Han-Chinese stuff in them.